Traditional print-based marketing simply can’t compete with digital search features available to consumers today. Large scale magazine productions can take days or weeks to deliver current up-to-date inventory to potential buyers. But that doesn’t mean that printing channels are not effective in reaching a select demographics of people. That’s why Autoxloo created the e-Magazine in order to bring the best of print format and digital distribution to your consumers. Without any print cost, no distribution, no postage cost and up to the second inventory your customers can have their magazine delivered right to their email, free for you and instantly for them. e-Magazines offer the best of both worlds. These e-Magazines behave like a normal hard copy of traditional brochures just on the computer screen. The e-Magazines are available in different formats including A4, C5 and more. Our digital brochures are made with the highest quality and professional design. They are virtual magazines that customers can download or subscribe to. Pages can be zoomed and flipped over, all this because of realistic 3D page turning. These e-Magazines could truly help you market your market your inventory and services at a reduced cost. 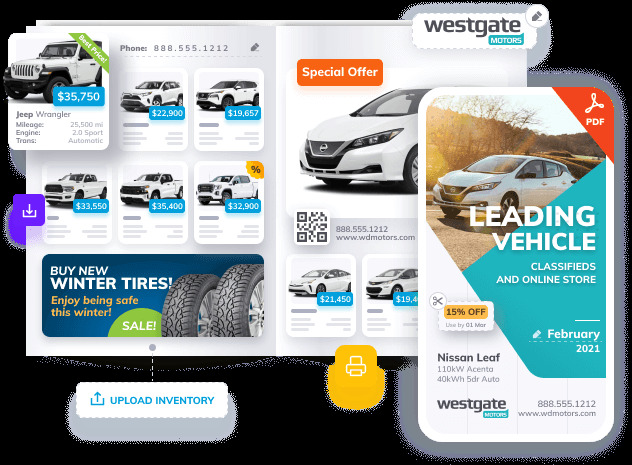 In addition to being less expensive than traditional print any vehicle information, pricing, details, contact persons or phone number changes made on your website are instantly updated on the e-Magazine without having the expense of a costly reprint. One of the main benefits is that e-Magazines are easier to share and distribute. Your customers can subscribe and have it proactively delivered to their inbox. It can also be embedded on your website, saved to a USB Drive, copied to DVD, or simply printed and handed to a customer in your showroom. You can also share your brochures on social networks e.g. Pinterest, Instagram with just few clicks or post them on Backpage and other online listing sites. Furthermore, you can send it directly to your marketing vendors and print publications to use as your template and be sure to ask for a cost reduction on the next print since we have done all the hard work for them. Our e-Magazine feature also has an excellent tracking tool for you to see how many times an online brochures has been viewed.